In 1976 our club was twinned with the Radio Club de Normandie in France – this page is dedicated to the history of events that have taken place as a result of this relationship. To the right is a photograph of the RCN visit in 1979, three years after twinning. Reproduced below is a very brief résumé of dates, numbers of visitors, and locations of restaurants and group visits. More detailed information is recorded in the newsletters of both societies following the events. These statistics relate purely to “official” visits and take no account of the dozens of additional private exchanges made personally by individual members. These statistics relate purely to ‘official’ visits and take no account of the dozens of additional private exchanges made personally by individual members. 17/18July1976 14 Picnic.Polegate Steam Engine Rally. 25/26Sept1976 25 Rouen University Restaurant.MotorMuseum &Zoological Park, Clères. Routot.Château de Robert le Diable, Moulineaux. 13/14May1978 36 Crest Hotel, Crowborough.HeverCastle, thenKingstanding Radio Station. 30/0901/101978 24 Château de Rombosc.Château de Martainville. 23/24June1979 26 Brighton Centre Restaurant.British Engineerium, Hove. 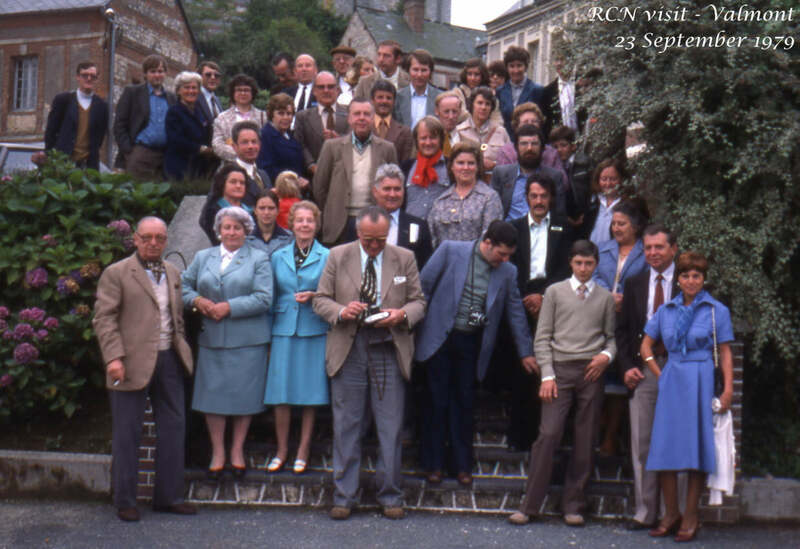 22/23Sept1979 19 Relais de Valmont.BenedictineMuseum &Distillery at Fécamp. 13/14Sept1980 23 Ravenswood Hotel.Bluebell Railway &SheffieldParkGardens. 21/22June1980 22 BonsecourTown Hall.Amateur TV Demonstration. 18/19July1981 16 Barbican Restaurant, Lewes.Sussex Mobile Rally, Brighton. 19/20Sept1981 9 Bosc-le-hard.Paluel Nuclear Power Station. 19/20June1982 20 Deans Place Hotel, Alfriston.FortNewhaven. 20/21Nov1982 1 Chairman’s (G4CLV)Invitation to RCN 70thAnniversary AGM. 18/19June1983 12 Grand Turc Hotel, Desville-les-Rouen.Musée de Ferronnerie, Rouen. 23/24June1984 2 Bravo Philippe F6BTP! SARS XYLs at Hailsham Leisure Centre.No organised visit. 08/09Sept1990 14 Bridge Inn, Newhaven.No organised visit.